champions for the first time in 50 years.... wahoooo! the first one is called being human is a mission and is on blahonline as a feature. there is also some discussion about theology and film kicking off on the boards there. i haven't blogged about blahonline for a while as it has been beset with teething problems but these are pretty much ironed out so we are ready to put some energy back into it again. it's a site set up to develop an online community to fuel peoples ongoing mission offering reflections, discussions, photo albums etc... if you are not a member sign up. 9. Real means three dimensional. 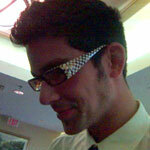 at breakfast in the hotel the waiter was sporting an amazing retro pair of two tone sunglasses. we wondered if the specials were back in town. turns out that these are actually the creation of designer alain mikli and the waiter had picked them up in a boutique in paris - impressive bit of subcutural capital in downtown winnipeg eh?! I told him "Don't do it that way. You'll never make a dime." But I will see more ??? The Human League, The Normal, Lou Reed, Scott Walker, Monks, Niagra? Joy Division, Lame 48?, Creation?, Scientists, Royal Trux, 10CC, Double T, Eric B & Rakim, Index, Basic Channel, Soulsonic Force, "just hit me"**, Juan Atkins, ?? ?, David Acteron?, Electric Prunes, Gil Scott Heron! i have a huge pile of books on my desk (well a dozen) - i haven't asked for any of these books. they have been sent to me by publishers obviously hoping i will blog about the books. well i make no promises - but will probably get round to it at some point... is this a new publishers strategy? anyone else getting books? well here is my dilemma - there's a book i want to read but wonder if i might get sent it by the publisher - steve taylor's out of bounds church. will zondervan send it my way (they are one of the publishers who have sent me some books)? should i wait? i have read steve's phd which is really good and have no doubt the book will be brilliant - skinny raves about it anyway... either way i am looking forward to it. richard's comments on the glass ceiling worry me too... any wisdom on the subject welcome. one event that got me thinking about this was when mark pierson was over last year teaching about alternative worship. but it wasn't billed as that - it was billed as art and spirituality and it drew more women than men.. whereas i figured that if it had been billed alternative worship that probably wouldn't have been the case. been on an encounter training weekend getting ready for my visit to bangalore and kerala in june. really looking forward to it. there will be a team of seven of us going. a few people have asked what i did at blah... in manchester and what the probes thing was all about. the idea comes from marshall mcluhan who was an amazing thinker most famous for his phrases 'the medium is the massage' and 'the global village'. he wrote about technology, media, and cultural change. but rather than write in big theoretical essays he preferred to use probes - short provocative statements that get under the skin and make you think. the book of probes is a collection of some of mcluhans probes from various works of his combined with the design work of david carson. it really is a fabulous book. i scanned a few pages and added some of my own. while they were scrolling round we discussed various probes of mcluhan's round tables. i have put them in a quicktime movie probes.mov if you are interested (about 1mb). then to nudge the conversation on from just cultural change to mission and the emerging church i presented four probes for people to talk about. it was great to hang out with ben and andy and then another ben and andy and helen after. hopefully this got blah... off to a good start in manchester. ben has added a few pics at sanctus. darryl shared this flash file he had put together with the youthmultimedia forum. it's about an 8mb flash file with U2 track Sometimes You Can't Make It On Your Own. i checked i could blog it and he said that was fine so go and downlaod it. it speaks for itself... thanks darryl! i got invited to do my bookshelf for church house publishing - short personal reviews of 5/6 books (i love the footnote definition of a blogger). 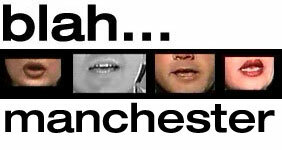 am in manchester tomorrow night for the launch of blah... manchester. i am excited about this. ben edson and i have been dreaming it up for a few months. ben then pulled together a team to make it happen. it's co-sponsored by CMS and Church Army. it will be a space for reflection, conversation, making friends and dreaming about mission, worship, church, spirituality and all that as it relates to the emerging culture. the title is inspired by the book of the same name by marshall mcluhan. in fact we will be discussing some of his probes on culture, media, technology and making the world new. probes are short provocations designed to get under the skin, provoke thinking. click on the image for an example. i've got four probes of my own to encourage reflection and conversation on mission in the emerging culture. in case you were wondering when the next blah... london will be we are planning a couple for the summer june/july. watch this space. if you are like me once e-mails have been around a few days they slide down your in box and out of sight and get neglected for a while... this makes me realise that when i don't hear back from people after a few days that must have happened to e-mails that i send. most people organise their in box in date order so why not set your computer date a month ahead of time, then any e-mails you send to people would stay at the top of their list for a month?!... just a random thought i had. Oscar John Poulson was born on Friday 15th April at 3.16am in the birthing pool at Ealing Hospital, Southall. He weighs 6 pounds and 13 ounces.